The US trade deficit is sometimes used as proof by President Trump that the US is treated unfairly by its trade partners. This is a popular – perhaps even election-winning – position. Presidential approval ratings on the economy have improved in 2018 alongside the escalating trade war. In practice, the US is not more open than other advanced economies. Around half of the US trade deficit, which was 3% of GDP in the latest data, is accounted for by trade with China. Germany, Japan and Mexico make up a further quarter. But these surplus countries don’t fit a particular profile in terms of openness. China is less open than the US, in terms of tariffs and non-tariff barriers. Mexico is in a free trade agreement with the US, meaning there is no difference between the tariffs of the two countries. Germany and Japan have similar tariffs to the US, and are more open in their treatment of foreign suppliers. The US’s official position on trade imbalances covers a broader set of factors than fit in a tweet, but also basically lays the blame for the US’s trade deficit at the feet of other countries. Along with trade and investment barriers, it highlights major trading partners’ slower domestic demand growth, and undervalued currencies. Separately, it has been suggested that relatively high barriers to trade in services have made it more difficult for countries which have specialised in services – such as the US - to export them. New IMF research shows reductions in the costs of exporting are associated with improvements in current account balances (made up of the trade balance and net income and transfers from abroad). However, the fundamental driver of the US current account deficit is the level of saving and investment in the US economy. Over many years, foreign capital has been readily available to fund investment at a level that could not have been sustained by US domestic savings. The dollar’s role as a global reserve currency plays a part in attracting these inflows, as does the level of savings in other countries. In its 2018 assessment of external imbalances, the IMF highlights that fiscal easing in the US is leading to a stronger US dollar and increase in the current account deficit in the coming years. We would add that the effects of the dollar’s appreciation during 2014-17 are still likely to be passing through to the current account, and the government and households both seem unlikely to increase savings. The IMF and the Trump administration agree on one thing: that the US should reduce its current account deficit. But the IMF’s policy prescription of fiscal consolidation, encouraging household saving, and resolving trade disagreements without raising tariffs and non-tariff barriers, is the opposite of what the US is doing. (The IMF also highlights the role of co-operation between countries to address global imbalances, with an onus on surplus countries to loosen fiscal policy). Increasing tariffs raises the price of foreign goods and thereby reduces demand for imports. Similarly, another country reducing its tariffs reduces the prices of goods it imports, i.e. exports from other countries. What the US has been trying to do with its trade policy is to create both effects, reducing its imports and increasing its exports. On the imports side, the US has raised tariffs on products worth around 4% of its total imports. However, other countries have challenged the tariff increases at the WTO, and US companies have applied for tens of thousands of the affected products to be exempt from the tariffs. On the exports side, things have not gone entirely to plan for the US either. While some trade partners have offered concessions, many have raised tariffs in retaliation against the US measures. Aside from retaliatory measures making US exports more expensive, the US’s tariffs harm the competitiveness of its own exports. US firms which make use of imported goods as inputs may be able to switch to domestically-produced alternatives, but at higher prices. Some of these firms are exporters, whose prices will rise, reducing demand for US exports. This has been the case for Whirlpool, the US-based manufacturer of home appliances, which has seen margins squeezed by US import tariffs on steel, and falling sales abroad, even as it has benefited from US import tariffs on washing machines, which have increased the costs of its main competitors in the US market. While the effects of the tariffs themselves may be limited, the tariffs are serving another purpose for the US in bringing countries to the negotiating table. In President Trump’s words, “Either a country negotiates a fair deal, or it gets hit with tariffs.” In bilateral negotiations, the US has been asking countries to offer up ways of increasing their imports from the US. South Korea earned an exemption from US steel tariffs by agreeing to quotas for its exports of those products and further opening its market to imports of US cars. The EU earned a reprieve from the potential US tariffs on cars by promising to buy more US soybeans and liquefied natural gas. But in the end, in market economies the decision to import from a given country is made by businesses on the basis of relative prices. During the last four decades there have been only two periods when the US trade deficit shrank significantly: 1987-1991, and 2006-2009. 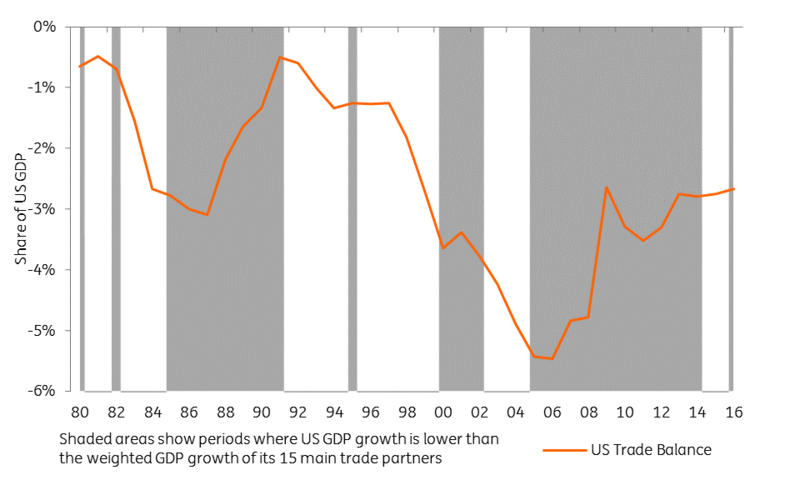 These periods saw US economic growth being outstripped by growth in the countries where it sent most of its exports (Chart 1) and followed declines in the dollar’s value. These conditions are not likely to be repeated in the near term. We expect the dollar to weaken against the euro and yen over 2018-2020, but not to the extent that it offsets the effects of higher US growth on the trade deficit. The official reason for tariff increases on steel and aluminium is to protect US national security. This involves a contested idea of national security that other countries are challenging at the WTO, but the international trade system is built on the recognition that trade poses a potential threat to domestic industries, even as it brings lower prices and variety to consumers, and productivity growth through innovation and competition. In the US’s case, the firms and industries most exposed to competition from Chinese imports have shed jobs over the past two decades. In turn, this has led to job losses in other industries through lower demand. The labour market has not been flexible enough for those workers to take up new jobs, leaving unemployment persistently high in parts of the US and giving the trade deficit its political charge. Could this have been avoided with a smaller trade deficit? Less trade over this period would have meant fewer people in employment overall, thanks to jobs created in US exporting industries and those serving the resulting rise in demand. It would have also meant US consumers paying higher prices for goods and services. Less trade would not have guaranteed continued high employment in manufacturing, thanks to productivity gains in manufacturing and the long-term trend in the US towards services production. Trade is only one of many sources of disruption, and protectionism a costly and ineffective response to the disruption it brings. Policies to help labour markets and industries adjust would have been, and still are, a better response. It seems that reducing the US trade deficit has become an end in itself for the President. However, his chosen means of achieving this – through raising tariffs, and extracting promises from other countries to import more from the US – won’t deliver the desired result. Demand for imports within the US is likely to continue rising, in spite of the tariffs. And other influences on the demand for US exports are not expected to deliver much growth. It’s not clear that US voters would thank President Trump for reducing the US trade deficit, even if the IMF would. This would involve fiscal consolidation and lower household consumption, in favour of saving. In common with other countries, the US has seen winners and losers within its population from globalisation. 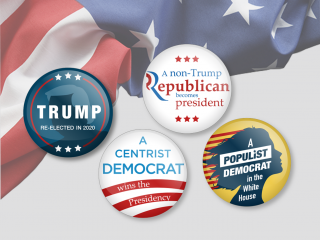 To address these, President Trump would be better off leaving tariffs alone in favour of policies that support the competitiveness of its industry and flexibility of its workforce.